Last Saturday saw my latest race, or rather challenge in this case - Moonlight Challenge, organised by Mike Inkster at Challenge Hub in Kent. Every year Mike organises a 50 mile challenge and this Moonlight one. Both are held over the same course at Marshside, near Canterbury in Kent and are multi-lap events. They are billed as Challenges rather than races, with the aim being that you do what you can in the allotted time and take satisfaction from completing the desired distance….. My target for this event was 3 laps (20 miles), after the events of the Thames Trot and my thigh strain - and I entered with the thought that after 3 laps I would see how I felt and decide from there on the rest of the event. Saturday arrived after a very wet couple of days and we were able to enjoy the warmth of the Gate Inn at Marshside, before the event and watch Ireland beat England at the rugby, however without a pint in my hand it lost some of it occasion. After a briefing from Mike, regarding the state of the course and impending water hazards we set off along the lanes and farm tracks that made up the course. My aim was to try to complete each lap (6.75 miles ) in about 1 hour, and duly finished the first in 55 mins, un-flustered, feeling ok and finding the footing ok in my North Face Hedgehogs. 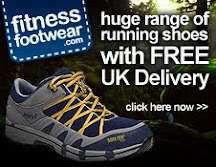 This was to be their last outing after clocking up over 400 miles in training and racing since I got the from Fitness Footwear last year and they have served my well, the grip is still tremendous, despite miles on road and tarmac, the uppers still water-tight, but the spring and cushioning has started to slip and so they must be laid to rest (must try the new model from The North Face and see what the differences are). Quickly stopping at the end for the second lap I was starting to feel the tension in my thigh increasing from the lack of off-road training in the last few weeks, and although I was comfortable on the flat road sections it was obvious that more than 3 laps would cause the problem to re-occur on the rutted trails and I was happy to call it a day after 3. 2 years ago I did the same event and pulled out at 3 laps, but with a knee strain created by a misplaced footfall, and was hoping for more this time, but it wasn’t to be….c'est la vie!!!! After some hot food and a quick promotional photo for one of the challenge sponsors (9-Bar) link I headed home and an earlier than expected night. Sunday and I could hardly move my left thigh and quad, due to the tightness from the event, so was very thankful that I had pulled up earlier than the total distance, and was happy to add a further 32,380 meters to the challenge total - bringing us to 321,184. May 9th - Halstead Marathon - original plan for Sedburgh SkyRace collapsed as race was postponed 1 year - however Alex and I may be doing a 100km race instead that weekend, as the closing date for the Spartathlon is the 31st May and the Grand union (qualifying race) starts on 29th May, so we may need the 100km as a fall-back entry race. So with this in mind I need the break and recovery period to make sure I am fit for these flat races. Hopefully once I get some pictures of the Moonlight Challenge I will post them on here, and give my sponsors something to be proud of. Update again soon - now where's that sauna???? ?